You can't buy loyalty like this. It ended well and the trapped dog was rescued. Thanks to a loyal setter and a group of volunteers, two dogs were found safe after a week lost in the woods in Washington state. Tillie, the setter, stayed with her doggie friend Phoebe for a week. She left each day to go find help. 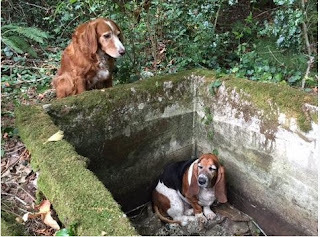 Phoebe a basset hound, was trapped in a concrete cistern in a ravine where Tillie stood guard. The nonprofit animal rescue organization Vashon Island Pet Protectors had posted photos of the dogs on their Facebook page, hoping someone would spot them. On Sept. 14, they received a call saying that while they were out on their property, a “reddish” dog had come up to them a few times, before promptly heading back into a ravine.